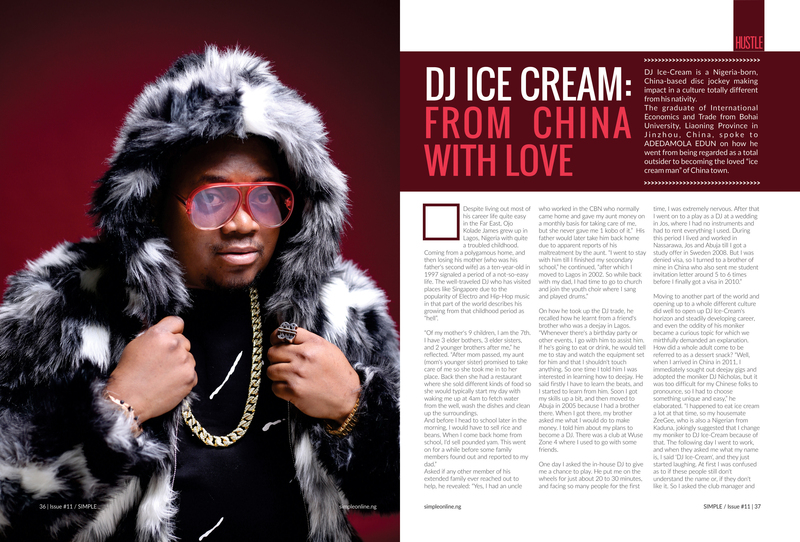 DJ Ice-Cream is a Nigeria-born, China-based disc jockey making impact in a culture totally different from his nativity. 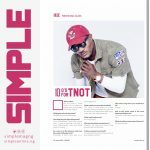 The graduate of International Economics and Trade from Bohai University, Liaoning Province in Jinzhou, China, spoke to ADEDAMOLA EDUN on how he went from being regarded as a total outsider to becoming the loved “ice cream man” of China town. 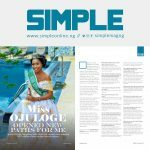 Despite living out most of his career life quite easy in the Far East, Ojo Kolade James grew up in Lagos, Nigeria with quite a troubled childhood. Coming from a polygamous home, and then losing his mother (who was his father’s second wife) as a ten-year-old in 1997 signaled a period of a not-so-easy life. 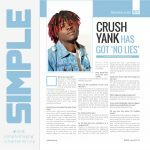 The well-traveled DJ who has visited places like Singapore due to the popularity of Electro and Hip-Hop music in that part of the world describes his growing from that childhood period as “hell”. “Of my mother’s 9 children, I am the 7th. I have 3 elder bothers, 3 elder sisters, and 2 younger brothers after me,” he reflected. “After mom passed, my aunt (mom’s younger sister) promised to take care of me so she took me in to her place. Back then she had a restaurant where she sold different kinds of food so she would typically start my day with waking me up at 4am to fetch water from the well, wash the dishes and clean up the surroundings. 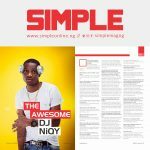 On how he took up the DJ trade, he recalled how he learnt from a friend’s brother who was a deejay in Lagos. “Whenever there’s a birthday party or other events, I go with him to assist him. If he’s going to eat or drink, he would tell me to stay and watch the equipment set for him and that I shouldn’t touch anything. So one time I told him I was interested in learning how to deejay. He said firstly I have to learn the beats, and I started to learn from him. Soon I got my skills up a bit, and then moved to Abuja in 2005 because I had a brother there. When I got there, my brother asked me what I would do to make money. I told him about my plans to become a DJ. There was a club at Wuse Zone 4 where I used to go with some friends. Moving to another part of the world and opening up to a whole different culture did well to open up DJ Ice-Cream’s horizon and steadily developing career, and even the oddity of his moniker became a curious topic for which we mirthfully demanded an explanation. How did a whole adult come to be referred to as a dessert snack? “Well, when I arrived in China in 2011, I immediately sought out deejay gigs and adopted the moniker DJ Nicholas, but it was too difficult for my Chinese folks to pronounce, so I had to choose something unique and easy,” he elaborated. 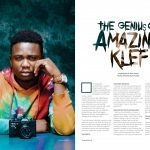 “I happened to eat ice cream a lot at that time, so my housemate ZeeGee, who is also a Nigerian from Kaduna, jokingly suggested that I change my moniker to DJ Ice-Cream because of that. The following day I went to work, and when they asked me what my name is, I said ‘DJ Ice-Cream’, and they just started laughing. At first I was confused as to if these people still don’t understand the name or, if they don’t like it. So I asked the club manager and he said they found it so funny that they like it. From then, at each club I worked, pool party, event and birthday party, I would be introduced as ‘DJ Ice-Cream’”. Further shedding lights on the DJ business, he detailed more on equipping and learning: “The cost of becoming a deejay and the amount of skills needed are now so low that pretty much anyone can do it, but I do think that there’s one huge factor that has affected DJ’ing and that’s the cost of being able to become a good DJ. And when I say cost, I mean that in terms of time invested as well as money. A few years back, to deejay, you have to save up money to buy two decks, an amp, speakers, and a mixer and so on. These alone could cost you maybe $1,800 or so, often more. You had to have these things at home or have access to them at least, because you have to practice your mixing so you wouldn’t get laughed out of the club, if someone ever lets you play. You also had to invest time and money into traveling to wherever your local record shop is at and buy records at the rate of around $7 to $8. There was no free downloads in the pre-internet era so that amount could mean a huge expense as well. You also had to invest time into learning how to mix two records together – no sync, no laptops, just an endless trial and error process.